Today, July 1, 2016, is the 149th anniversary of Confederation, the union of Ontario, Québec, Nova Scotia, New Brunswick and Prince Edward Island to form the nation of Canada. It soon expanded to the west – Manitoba was added in 1870, British Columbia in 1871, Alberta and Saskatchewan in 1905. In 1949 Newfoundland became the 10th province. There are also three territories – Yukon, Northwest Territory and Nunavut. The Hudson’s Bay Company is Canada’s oldest business, founded as a fur trading company in 1670. Nowadays, it is Canada’s largest department store chain. The Hudson Bay point blanket, pictured above left, is an all wool blanket that has been manufactured in England for the company almost from the beginning and is an icon both of the company and of Canada. Tim Horton’s is not nearly as old, only dating to 1964, but it is far and away the favourite coffee shop and fast food eatery of Canadians. There is a Tim Horton’s restaurant for every 10, 000 Canadians, they have over 20% of the fast food market and 75% of restaurant baked goods sales and coffee sales. Most of us frequently hold in our hands a cup like the one pictured above to drink a Tim Horton’s “Always Fresh” coffee. Ask her what comes after kindergarten. If she says Grade One, she is Canadian, if she says First Grade, she is American. Ask her what is the last letter of the alphabet. A Canadian will say zed, an American zee. Ask her what to call a multi level parking facility. A Canadian will call it a parkade. I’m not sure if Americans have a specific word for it. This morning, two young men walked into a Tim Horton’s in Saskatoon and ordered breakfast sandwiches. They insisted that the onions had to be diced, not just sliced. The counter person explained that they could not do it. This led to an argument and finally one of the young men reached into the other’s pocket, pulled out a garter snake and threw it behind the counter. Everyone scattered. The police came, picked up the snake (garter snakes are harmless) and found a temporary home for it. It will be released into the wild in spring. The police also found the two culprits and they probably won’t get off so easily. Now, people do not ordinarily go around with a snake in their pocket – not even in Saskatchewan – unless they are planning some outlandish stunt. Asking for diced onions on a breakfast sandwich was just a way to start an argument. It was probably about a year ago that someone went into a Tim Horton’s, in Edmonton I think, bought a coffee and then left money to buy coffee for the next 100 customers. That soon spread across Canada, with unknown benefactors paying for coffee for large numbers of Tim Horton’s patrons that were unknown to them. That was a copycat streak that created a string of good news stories for about a week. Times being what they are . 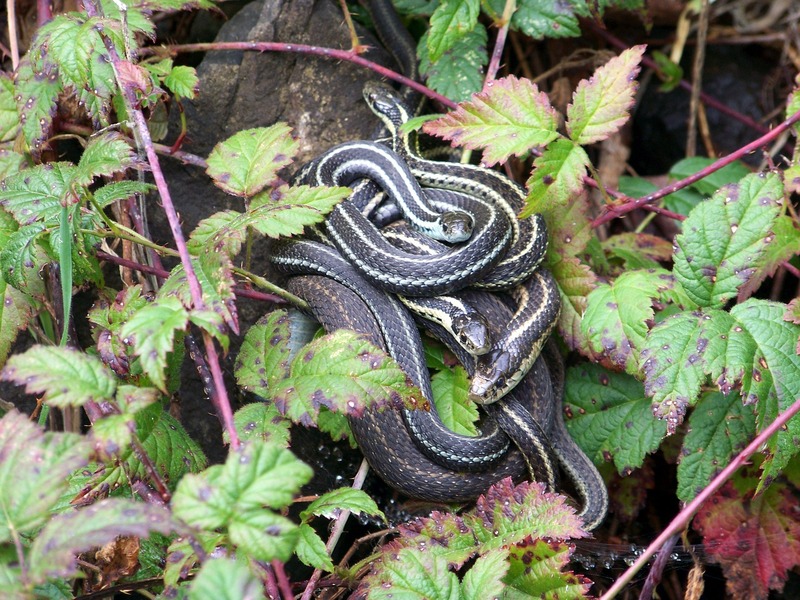 . . Well, I just hope that all the garter snakes in Canada have gone into hiding for the winter. Tomorrow is our anniversary and I am taking my wife out to dinner in a restaurant that opened just one week ago. The restaurant is in Moose Jaw, the city where our married life began 43 years ago. One of my cousins and his wife will meet us for dinner, we plan to visit two other elderly cousins after dinner, then meet my wife’s sister at 5 o’clock at Tim Horton’s. That means a 2½ hour drive each way, but it will be a pleasant break from our normal routine. Tim Horton’s is a Canadian institution, far and away the biggest fast food chain in the country. There are no burgers on their menu, just paninis, wraps, bagels, muffins doughnuts, soup, and coffee of all kinds I have a special fondness for their mocha latte. Apparently 80% of the coffee served in Canada is served by Tim Horton’s. I don’t make a practice of commenting on the news, but two incidents in the last couple of days have got me wondering. In Toronto, a young man, 18 years old, got on a street car behaving bizarrely, pulled a knife and ordered everybody else off. The police came, 20 of them, and one of them went on the streetcar and ordered the young man to surrender. Apparently the police officer felt threatened, even though the young man was not near enough to harm him. He shot the young man nine times and ordered another officer to tazer him. In Montréal, a seventy-two year old man threatened meter readers with a gun, then locked himself in the house, leaving his wife locked outside. The police came, as many as in Toronto, and the man fired one shot at them. The police were aware there were other guns in the home. They tried various means to communicate with the man and finally after 20 hours one policeman entered the house and fired one bullet. The results: in Toronto a young man is dead, the family is hurt and angry, a police officer is suspended, an investigation will be held. In Montréal an elderly man with dementia is safe and sound, the family is relieved and happy, the police are heroes. The bullet fired in Montréal was a rubber bullet. Hasn’t Toronto ever heard of rubber bullets?